Liebig's Law of the Minimum can be used to effectively control algal blooms in a eutrified pond or lake. The addition of microbes, in a process called bioremediation, can reduce nutrients to effective control algae. How does nutrient reduction help reduce algal blooms? The ultimate goal is to prevent noxious algal blooms (e.g., dinoflagellates and blue-green cyanobacteria) by nutrient manipulation. 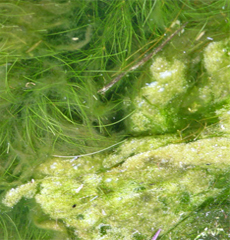 The growth of algae can be manipulated by nutrient dynamics. This is can be achieved through bioaugmentation in a process called biological nutrient removal (BNR). Based on the stoichiometric composition of algae, typically, either nitrogen (N) or phosphorous (P) is the element present in the algal environment that, when supplied at a rate less than needed, can limit the growth of algae; this is the limiting element. (Liebig's Law of the Minimums) This is important in managing eutrophication-related water-quality impairment. The bacteria used in bioaugmentation are selected specifically for their ability to degrade organic material and detritus, and nitrify ammonia and because of the high CFU counts (colony forming units) do so at an accelerate rate. These bacteria consume the nutrients in the water. The microbes ingest carbon, nitrogen, phosphorous at a ratio of 100:10:4. In the presence of calcium carbonate and high pH, an insoluble phosphorous particulate is created by the death of the microbes. This reduces the amount of bio-available nutrients that are then available for the algae. Nitrate and ammonia are typically available forms of Nitrogen. If the bioaugmentation process is targeted for ammonia, and the ammonia is reduced, then we have in effect altered the ratio of nutrients in the water. The ratio of nitrogen to phosphorous has been disturbed and ceases the production of algae. Phosphorous occurs in nature and is critical to the support of life. However, excess phosphorus can cause a severe environmental impact in both fresh and marine ecosystems. Algae blooms are caused by an over abundance of nutrients and phosphorus is often the limiting nutrient in the growth of algae.